The Manuals for all of the above nebulizers are almost identical. The common parts are listed here in this write-up, and the individual manuals are in the red menu bar at the top of this page. While all are closely related and have most aspects the same, some specialty ones such as the Mira Mist CE have more information required and their individual sections will be longer. These nebulizers are designed to work with acids, solvents, and various liquids and gases that are dangerous to handle. The user must be skilled in the handling and usage of such liquids and gasses. The manufacturer assumes NO liability for damage however caused in the handling & usage of the nebulizers. Use at your own risk. If this is not acceptable, please return the nebulizer. You are eligible for a full refund if the nebulizer is returned unused within three months of being shipped to you. Do Not Handle unless you are sure that the nebulizer is dry, or washed with clean water. Acids, particularly HF, often look like water and will wet the end of the nebulizer during usage. This device operates on compressed gases. Appropriate care must be taken. If in doubt about correct operating procedures, call an experienced operator or call Burgener Research at +1 905 823 3535. Burgener nebulizers will pulse if the pump can not deliver constant sample flow: When using peristaltic pumps, please change your pump tubing often. For very low flows or highest precision, use a surgeless pump or syringe pump if possible. The gas orifice is at the very tip of the nebulizer. It is made of Teflon® or PEEK, both of which are VERY SOFT. The tip is very easily damaged and should NEVER be touched with fingers, tissues, or anything else. If the tip is accidentally touched, and the nebulizer continues to operate, then it is still functional, and its use can be safely continued. Burgener Nebulizers generally use Idex / Upchurch 10/32 fingertight fittings for the gas line and liquid lines. The Teflon bodies are very soft and the threads are easily stripped. Only Gently tighten until snug, do not force or the threads will be stripped. The PEEK bodies are much stronger and you may tighten the fittings more without damaging the body, but if the liquid line is too tight, it squeezes the liquid capillary shut and you do not have any liquid flow to the nebulizer. For both gas lines and liquid lines, gently finger tight is the appropriate tightness. Burgener Analytical Nebulizer bodies are either 100% Teflon® or PEEK. Generally they will not break. If they are dropped such that the tip is deformed, then they will be irreparably damaged. If they continue to operate after being dropped, then they have not been affected, and their use can be safely continued. The gas orifice is at the very tip of the nebulizer. Teflon® is VERY SOFT. Touching the tip with your finger, a tissue paper, or anything else MAY DESTROY your nebulizer. The only major caution on a Burgener Nebulizer is DO NOT TOUCH THE TIP. Having said that, you will accidentally touch the tip sometimes. If it works afterwards you have done no harm. If the gas orifice is untouched, the nebulizer will not be harmed. Burgener Nebulizers unique design minimizes the ability of salts to build up or to stick so it is rare that adding humidity to the Argon will improve the lifetime or usefulness of the nebulizer. In fact for low flow applications in which you want everything to vaporize, humidified Argon would prevent that and be significantly detrimental. We generally suggest that humidifying the Argon is not useful. It is also not harmful to the nebulizer. If you are running the nebulizer at 100 microliters a minute or more, humidifying will not be detrimental since at 100+ it will not all vaporize anyway. Your new Burgener Nebulizer is unique. It should give you a long and convenient service on almost any liquid you can pump to it. The operation and care of your nebulizer is different from most other nebulizers in several important ways. The capillary tubing is attached with 10/32 UpChurch® chromatographic fittings. We suggest using our .043" OD X .018" ID Polyethylene Capillary tubing, but you may use any other tubing that fits an UpChurch 10/32 fitting. Generally we recommend that you use sample capillary tubing with a smaller ID than the nebulizer so that any particles in the liquid will plug the sample line before they plug the nebulizer. 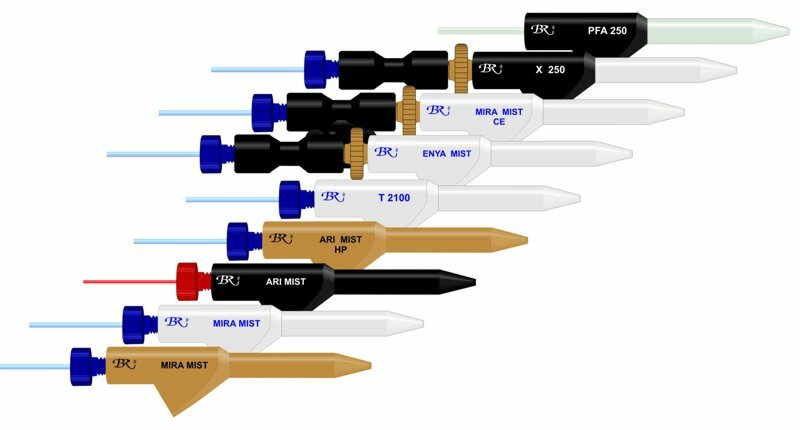 For instance, for a Mira Mist, a .018" ID or smaller ID sample capillary tube is the desired size. It is much safer & easier to replace the capillary tubing than to clean the nebulizer. Please do not overtighten the sample line fittings. Doing so will squeeze the capillary tubing and may squeeze it enough to block any liquid flow in the sample line. Gently snug is the desired tightness. The gas line is attached with UpChurch® 10/32 chromatographic fittings. We suggest 2 mm OD X .039" ID Teflon tubing. This is flexible, non contaminating, and is rated for pressures much higher than the 50 psi required for the Mira Mist Nebulizer. A gas line filter is NOT included in the nebulizer. Particles from the gas line can destroy the nebulizer. We have found this used to be the main causes of blockage of our T2002 nebulizers, but it is rare in the Mira Mist and Ari Mist design. But as a saftey, please ensure that the gas line to the nebulizer is clean of any particles. The optimum sample flow rates are more determined by the instrument than by the nebulizer. The mist quality is usually not dependant on the sample flow over a very wide range, such as 0.2 ml/min up to 2.5 ml/min for a Mira Mist. Burgener Nebulizers do not have any suction, so they require a pump or gravity feed to supply the sample solution. The pump speed and the quality of the pump tubing have a large effect on the stability of the nebulizer. Try to select a pump tubing size that allows running the pump at a high speed. So for low sample flow, use orange green or orange blue pump tubing. Generally the pump tubing should be changed Every Day for maximum stability and lowest %RSD. For a T2002, 1 - 2 ml/min seems to work best. For gas flows near 1 l/min., some systems optimize at less than 1 ml/min. You may pump faster, 4 or 5 ml/min will not harm the nebulizer, but there may not be increased signal, and you may drown the torch. For a T2002 running 2 ml/min, we recommend orange/orange peristaltic pump tubing with a fast rotating rate rather than larger tubing at a slower rate. Slower rates produce larger surges. For lower pressure settings, an increase in sample rate may improve %RSD. For the longest life and best performance, wash your nebulizer by simply running water as a sample for 10 minutes at the end of the day before shutting down the plasma. Any other form of washing is usually unnecessary. Please DO NOT wash your nebulizer in acid or solvents to 'prevent salt build up'. Teflon does not wet, so salts do not build up. However, the internal capillaries are entirely Teflon or Peek, and ther is no filter to soak up your washing solutions. So the nebulizers may be washed if you wish. If you do wash it, be sure that the wash solution is clean. Any particles in the wash solution will likely plug the gas lines or sample lines. There are a few differences with the T2002: Please DO NOT immerse a T2002 nebulizer completely in any liquid (water, acid, or any other solvent). It would cause saturation of the filter plug and plugging of the gas orifice. DO NOT remove the filter in the back of the nebulizer under any circumstance, as this usually dislodges dust which will fall into the insides of the gas line and probably plug the gas orifice. Burgener Nebulizers use our patented Enhanced Parallel Path design. This design allows the Nebulizers to have a sample path that is constant in size throughout their length, except at the beginning and ends, where the sample line INCREASES in size. With this unique sample line design, and the unique SOLID construction, it is possible to clean out particles with a cleaning wire. Caution: You MUST use a microscope or 10X magnifying glass to do this. The gas orifice is on the edge of the sample hole, and if you TOUCH the gas hole, you will destroy the nebulizer. To clean out a blockage, push a properly sized wire (for a Mira Mist use .015" OD or less, for an Ari Mist use a .008" OD wire, for an Enya Mist do not try - there is no wire small enough and strong enough to work.) from the front of the nebulizer until it sticks out the back of the nebulizer. Be sure that the cleaning wire is rounded at the tip, if it is sharp it will tear apart the inside capillaries and destroy the nebulizer. A Burgener Nebulizer's operating pressure is determined by the torch. Torches require 0.6 to 1 liter per minute. The pressure varies with each nebulizer, but the flow should be the almost the same for an individual torch. Each nebulizer should be tested by looking for the pressure which gives optimum precision. This will generally be found to be a narrow range. An initial pressure can generally be found by observing the central channel of the plasma while aspirating a solution of 1,000 ppm Y. Adjust the pressure until the red tongue is just level with the upper turn of the work coil. This is easy to observe with a relatively new torch, but, once the torch becomes discolored, it may be difficult to see this tongue. In this case, there is little alternative but to begin at 2/3 the pressure for 1 liter/min (listed on the label) and increase at 2 to 5 psi intervals until the best precision is found. Some newer instruments are trying to run at 0.2 - 0.5 L/min. Sadly, this does not work properly for our nebulizers. Some individual nebulizers may be able to give satisfactory results at such low flows, but most will spit and give poor %RSD. Some nebulizers are sensitive to orientation. The gas flows from the nebulizer at a bit of an angle, and this effects the flows in chambers, especially cyclonic chambers. Be sure to check orientation once the apparently optimum nebulizer pressure has been found to determine which gives the better results. For the orientation check, rotate the nebulizer in 45 degree increments and check for a gain in precision. With most Burgener Nebulizers, the rotation usually has only a very small effect. Note that the optimum angle depends on the alignment of the gas orifice and the body of the nebulizer. Each nebulizer is unique - there is no standard angle. The inner capillaries rotate as they are press fit into the bodies, so the position of the gas orifice is not fixed with respect to the outside of the nebulizer. The only way to optimize is to rotate the nebulizer while running a solution and monitoring the intensities and background. For very low flows, you will need to run the nebulizer at 0.9 - 1.2 L/min Argon, even for torches that normally run at lower flow rates. The surface tension of the sample and the Argon flow rates determine the lowest flow rate for the nebulizer. Adding about 10% Alcohol to the sample will help achieve the lowest flow rates. Pure water has a high surface tension and will not operate smoothly at 5 microliters/minute. Most Burgener Nebulizers are designed to use standard chromatographic 10/32 fittings for the gas lines and for the capillary tubing fittings. This allows minimal dead space between the nebulizer and capillary tubing. It also allows the capillary tubing to be easily changed. Simply unscrew the old capillary tubing fitting from the back of the nebulizer. If you have capillary tubing with pre attached fittings, simply screw in a new line. Gently tighten it, and you are done. If you are re-using your fittings and changing the capillary tubing, then you need to remove the old capillary tubing from the fitting and replace it. For some sample line tubing, especially 1/16" (1.6mm), the tubing is easily pushed into the fitting. Let it extend out a tiny bit and simple screw the fitting back into the nebulizer until it is just finger tight. Test it for tightness by pumping water. If any leaks out during the test, you may need to tighten the fitting a bit more, or the capillary tubing is not squeezed enough by the fitting. If the capillary tubing needs more squeezing, then adjust it so that it extends out past the fitting a tiny bit more and try again. To replace the capillary tubing into the UpChurch fitting, you may have to stretch the capillary tubing first: wrap some around your fingers or use two forceps and wrap it around the tip of the forceps and pull until the tubing is 3/4 to 1/2 the original OD. Then pull through the stretched part and continue pulling until some of the unstretched part extends past the tip of the fitting. Then cut off the excess at the tip of the fitting. The only portion of the sample path that is actually part of the nebulizer is at the tip. It will not plug with dust or sand or other tiny particles. However, the capillary tubing may occasionally plug. Generally, the capillary tubing plugs at the joint between the pump tubing and the capillary tubing. To clear such a plug, just cut off 1 mm of the capillary tubing closest to the pump, and use it again. For plugs in the middle of the tubing, or eventually, if the tubing is getting too short, you will have to replace the capillary tubing. 1. Pull out the old capillary tubing. It is just held in place by tension. 2. Take a piece of new tubing, e.g. Polyethylene Tubing, with O.D. 1.09 mm (0.043 "); I.D. .38 mm (0.015 "). Measure out the desired length (About 15 " or 38 cm). 3. Wrap it around your fingers and stretch out about 4 inches to about 1/2 its original diameter. 4. Push the stretched portion through the Nebulizer's sample path until it extends out past the end of the nebulizer. Use the stretched portion to pull unstretched tubing past the tip of the nebulizer. 5. Cut off the stretched portion. Pull back the unstretched portion, until the tubing is recessed about .25 " (about 6 mm) from the tip. The distance of the recess is not critical, as long as it is about .25 " or more.